Here is a wonderful example of pre-Christian spring imagery before it became "cute-ified". The birds on this pysanka (Ukrainian decorated Easter egg) are strong and serious animals, not "tweety-birds" or baby chicks. They have no-nonsense beaks and big claws. In fact, they're almost scary-looking. They have to be big and strong, because their job in pagan Slavic mythology was to fly high in the sky and carry messages and prayers to the sun god. This image is from Kul'zhyns'kyi's "Description of the Collection of Pysanky", based on the collection of the Skarzhyns'ka museum in Lubny (Poltava region). Kateryna Mykolaivna Skarzhyns’ka (1853-1932) founded the first-ever private Ukrainian museum in 1880. After seeing images of pysanky in Russian periodicals, she began to collect pysanky from all regions of Ukraine with the help of several well known ethnographers. By 1898 her collection included 2123 pysanky. 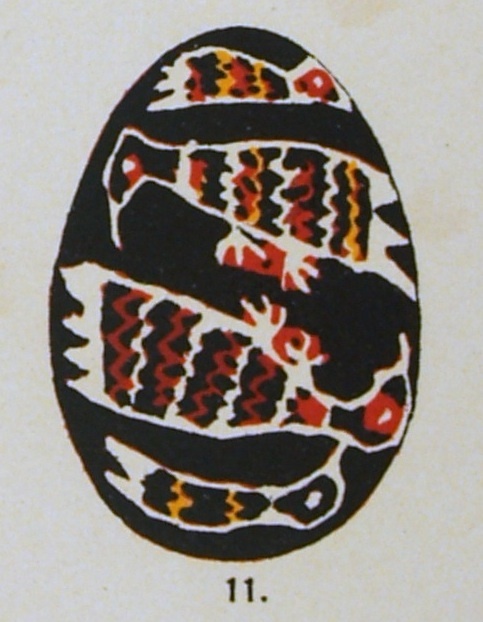 The design of each pysanka was reproduced on index cards, and the ethnographer S. Kul’zhynks’lyi systematically organized the images for publication in a catalog. The first edition of the “Description of the Collection of Pysanky” based on the Skarzhyns’ka collection was published in Moscow in 1899. The UkrHEC is fortunate to have a copy of this rare first edition in its rare book collection.